Disaster. 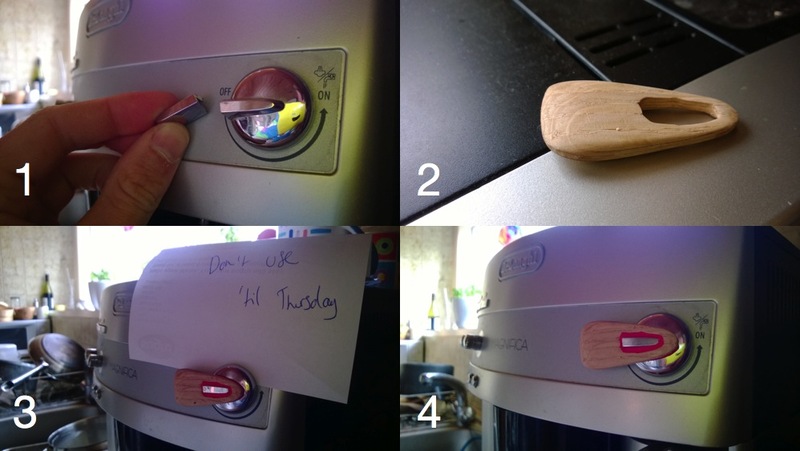 The steam lever on our trusty coffee machine snapped. After a brief realisation that what we’d assumed all these years to be metal was actually plastic, the wider and infinitely less palatable truth dawned: no more morning coffee! I set to work with an old piece of oak, salvaged from a bed headboard bought for £1 at Fakenham auction, and an amazing fixing putty called Sugru. After cutting, planing, filing and sanding the new lever into the right shape, the Sugru (the red stuff in the photo) is applied as a flexible putty. It is then left overnight and sets rock solid, bonding the wood to the broken plastic. The new wooden lever is actually easier to control and much more tactile.